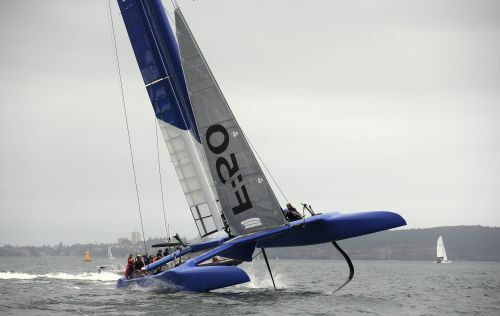 SAN DIEGO (AP) — SailGP, the new sailing league founded by tech billionaire Larry Ellison and five-time America's Cup winner Russell Coutts, will leap from concept to reality next month when six souped-up catamarans hit the starting line off Shark Island in Sydney Harbor. SailGP will be a true global league, featuring many of the world's most accomplished sailors racing aboard the planet's fastest sailboats, 50-foot, wing-sailed catamarans that fly across the top of waves on hydrofoils. Teams representing six countries will compete at five tour stops, with the finale being a winner-take-all, $1 million match race between the top two teams to crown the 2019 champion. It's not the prestigious America's Cup, and that's OK with these sailors. "Nothing like this has been done in sailing," said Tom Slingsby, an America's Cup champion and Olympic gold medalist who will skipper the deep Australian team starting with the inaugural regatta in home waters Feb. 15-16. Ellison, the co-founder of Oracle Corp. and one of the world's richest men with a fortune estimated at around $60 billion, will initially cover the league's costs. If his vision plays out, SailGP will move to a franchise ownership model. SailGP will stand out from other professional classes, said Australian Nathan Outteridge, who will skipper Japan SailGP Team. There won't be team owners driving boats as there are on other circuits, and this will be as close to nation-vs.-nation sailing as there can be. "The big difference is this is probably the most difficult boat in the world to sail and it's going to be proper professional sailing," said Outteridge, who has won Olympic gold and silver medals and skippered a Swedish-backed team in the last two America's Cup regattas. SailGP came along after Ellison's run in the America's Cup ended when his two-time defending champion Oracle Team USA was soundly defeated by Emirates Team New Zealand in Bermuda in 2017. While the America's Cup will return to monohulls in 2021, SailGP took three 50-foot foiling catamarans from the 2017 America's Cup and redesigned and re-engineered them, and built three new ones. "I think this isn't just filling a void in sailing, it's creating something new that has the potential to really span the reach of our sport. So that's pretty exciting," said Coutts, who once sailed undefeated through three straight America's Cup matches, for two different countries. He won twice more as CEO of Oracle Team USA. Coutts feels the timing is right both on and off the water, such as taking advantage of the many advances in digital technology in the broadcast world. "With the way people are consuming information these days, I think this suits this format," he said. "It suits us a lot more, possibly, than it would have 10-15 years ago." Racing will be available live globally, and in most cases streamed at SailGP.com with a second-screen app set to be launched in early February. Slingsby sailed with Oracle Team USA in its remarkable comeback win in 2013 on San Francisco Bay and again in Bermuda. He explored doing an Australian campaign for the 2021 America's Cup but couldn't secure the financial backing needed to be competitive. While not closing the door on the America's Cup, Slingsby is excited for SailGP's promise of continuity. He points to the four-year gap between Oracle's 2013 win and the next regatta. "The problem was, it disappeared out of the eyes of the public for four years and lost all momentum," Slingsby said. "This league will change that. Every month or two we'll have these boats racing. It's going to be a sport that's always in the public eye." Crews had limited practice time recently in New Zealand. The catamarans — called F50s — have been moved to Cockatoo Island in Sydney Harbor and are going in the water this week. Crews will get more practice time starting Feb. 1. Slingsby and Outteridge said the cats are capable of going faster than 50 knots (57.5 mph). There have been changes to the daggerboards and rudders since Bermuda that will increase the boats' performance. In a substantial change, batteries will be used to raise and lower the daggerboards, and grinders will be used only to trim the wingsheet. "I can tell you that in Bermuda, they were the most painful boat to sail," Outteridge said. "You had two people sailing and four people grinding. They were massively energy-hungry just to get boards up and down and keep pressure up on cylinders to control for flight. You had four people grinding as hard as they can the whole time the boat was moving. That was not sustainable. ... Unless you were driving or trimming the wing, you were not a sailor, just a grinder. This brings more sailing to the boat." With the Australian team assigned to Slingsby, Coutts tapped Outteridge to head the Japanese team with the intention of building a foundation that will eventually lead to it being 100 percent Japanese. Likewise, New Zealander Phil Robertson is skippering the Chinese team. The other teams will be skippered by nationals: Great Britain by 49er class world champion Dylan Fletcher, France by Nacra 17 world champion Billy Besson and the United States by Rome Kirby of Newport, Rhode Island, who also sailed with Oracle Team USA in the 2013 America's Cup. "It's going to be extremely competitive," Kirby said. "The whole circuit has a ton of potential and I'm really looking forward to it. It's definitely going to take some time to develop, especially with the boats being so fast and powered up." After Sydney, the tour stops in San Francisco on May 4-5; New York on June 21-22; Cowes, England, on Aug. 10-11; and Marseille, France, on Sept. 20-22 for the finale that will include a winner-take-all $1 million match race.